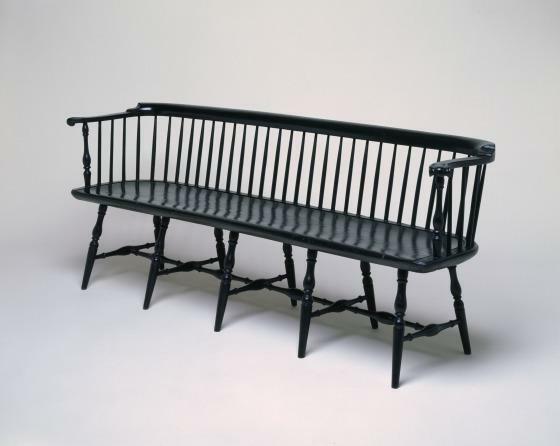 Ten-legged Windsor settees are uncommon enough to attract special attention. 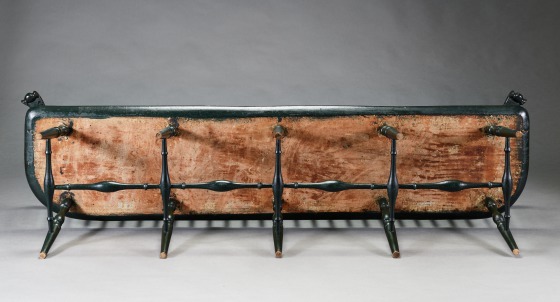 Spindles repeated in the back of this atypical object create rhythm, while the well-proportioned turnings and carved arm rests promote harmony and balance. 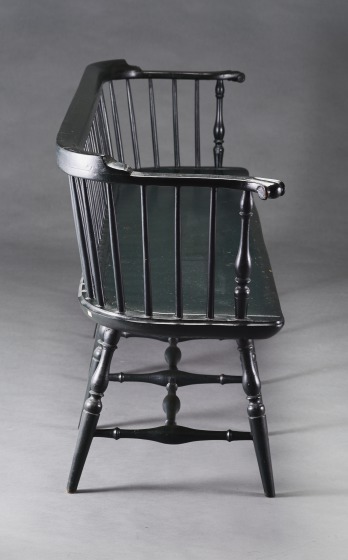 With turned legs, spindle backs, and carved plank seats, Windsor chairs and settees were sturdy and easy to produce in quantity and were therefore excellent seating furniture where durability was a concern. 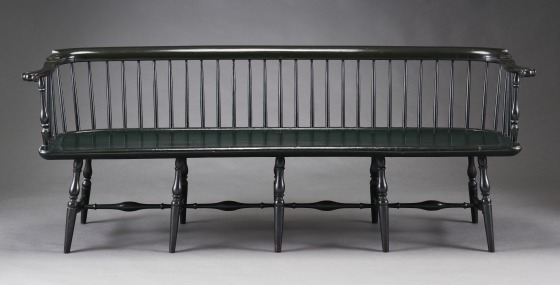 In addition, simple joinery and the repetition of parts allowed the chairs to be produced in batches, suggesting an early "mass-production" approach in which several turners might contribute parts to a single chair or settee. 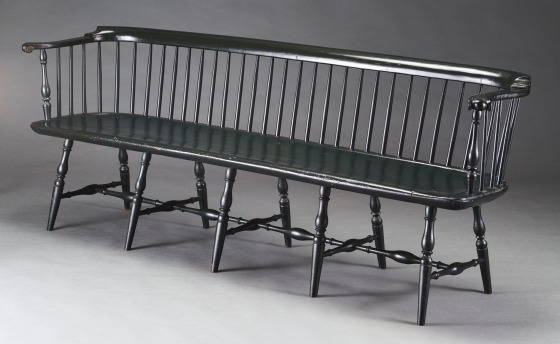 Philadelphia was a leading producer of Windsor seating, shipping chairs as far south as Louisiana and northward to distant Maine. This example was originally painted a grayish brown. Kevin W. Tucker, DMA unpublished material, Label text (1985.B.62), 2006. Translating Culture II is a collaborative project between the DMA, MAP - Make Art with Purpose, and Architecture Cluster students from Dallas ISD's Skyline High School. The group met over the course of two months, finding inspiration through the exploration of the DMA's collection and working in small teams to create personal interpretations, creative responses, and contextual information. 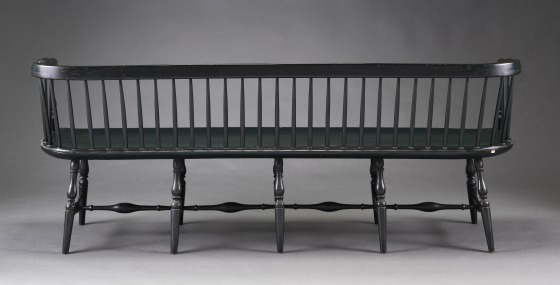 Faith P. Bybee purchased this settee in Rhode Island, and insisted it was made there. 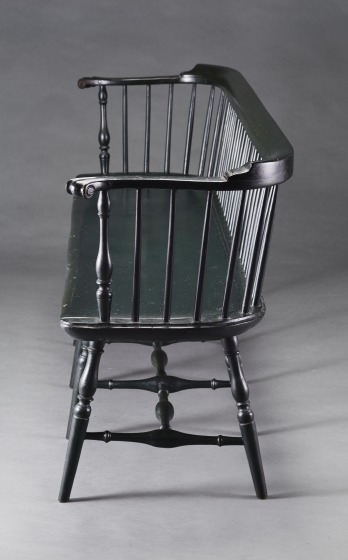 However, it was actually made in Philadelphia even though it turned up in Rhode Island, as many Philadelphians summered in Newport in the 19th and early 20th centuries, and shipped furniture north to furnish their cottages.